The Innovyze products InfoSWMM and H2OMap SWMM are always based on the current version of EPA SWMM 5 (the current version is 5.1.007) and we pleased to announce that the current version of both InfoSWMM and H2OMap (v13) are also able to use the output of the EPA’s Storm Water Management Model Climate Adjustment Tool (SWMM-CAT) to help our users estimate future changes in temperature, evaporation and rainfall for their simulation modeling or modelling. The Storm Water Management Model Climate Adjustment Tool (SWMM-CAT) is a new addition to EPA SWMM5. It is a simple to use software utility that allows future climate change projections to be incorporated into SWMM5. The SWMM-CAT tool provides a set of location-specific adjustments that derived from global climate change models run as part of the World Climate Research Programme (WCRP) Coupled Model Intercomparison Project Phase 3 (CMIP3) archive. These are the same climate change simulations that helped inform the United Nations Intergovernmental Panel on Climate Change in preparing its Fourth Assessment report. SWMM-CAT and the EPA Stormwater Calculator for Low Impact Development simulation are both a part of the President’s Climate Action Plan. 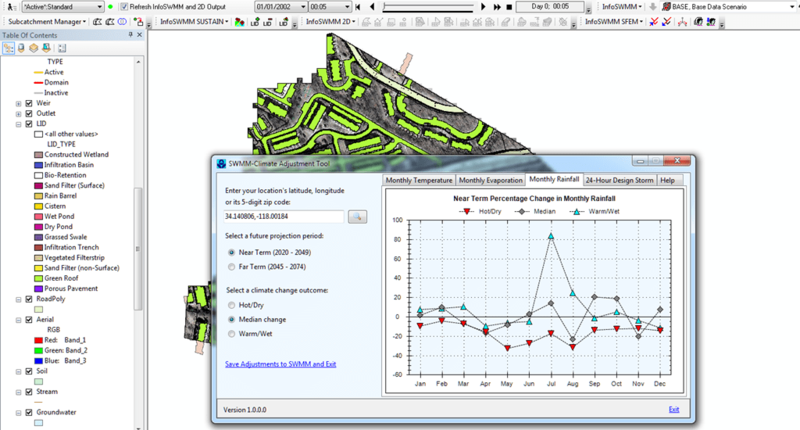 The continued development of predictive modeling tools such as SWMM5 will provide urban planners and other stakeholders with the resources they need to incorporate both traditional stormwater and wastewater system technologies with the emerging, innovative techniques of green infrastructure. The collective impact will be more sustainable urban areas and healthier waterways across the nation. SWMM-CAT can be downloaded here. If you are interested in learning more about SWMM-CAT, please join the EPA webinar on 2/25/15 at 12:00 PM ET which will be conducted by Dr. Lewis Rossman (developer of both EPANET and SWMM5 for the EPA). SWMM-CAT is easy to use with InfoSWMM and H2OMap SWMM. You download the SWMM-CAT program from the EPA and then simply enter your watershed’s Zip Code, Future Projection Period and Future Climate Change outcome (Figure 1). The Monthly Hot Dry/Median Change/Warm-Wet estimates are then estimated for Temperature (Figure 1), Evaporation (Figure 2) and Rainfall (Figure 3). The Monthly Adjustment Factors are then saved to a SWMM 5 INP File (Figure 4), imported into either InfoSWMM or H2OMap SWMM (Figure 5) and used in Future Scenario’s as part of the Climatology Settings (Figure 6). The monthly adjustments can be be used to simulate long term changes in the climate as shown for an example 1000 year simulation (Figure 7) or analyzed using the Innovyze Output Statistics Manger(Figure 8). Figure 1. The SWMM Climate Adjustment Tool estimates of changes in Temperature for Monrovia, CA for a Far Term Estimate with a Hot Dry Change Condition. Figure 2. The SWMM Climate Adjustment Tool estimates of changes in Evaporation for Monrovia, CA for a Far Term Estimate with a Hot Dry Change Condition. Figure 3. The SWMM Climate Adjustment Tool estimates of changes in Rainfall for Monrovia, CA for a Far Term Estimate with a Hot Dry Change Condition. Figure 4. The Monthly Temperature, Evaporation and Rainfall Change Estimates are saved to a SWMM 5 INP file from SWMM-CAT. Figure 5. The Monthly Temperature, Evaporation and Rainfall Change Estimates are imported to InfoSWMM or H2OMap SWMM using the Superb Import EPASWMM 5 Data Tool. Figure 6. The Monthly Temperature, Evaporation and Rainfall Change Estimates are imported to InfoSWMM or H2OMap SWMM in the Climate Adjustment Dialog. Figure 7. The Monthly Temperature, Evaporation and Rainfall Change Estimates can be used as future Scenario’s for long term modeling or modelling such as this 1000 year Runoff, LID and Water Quality simulation. Figure 8. 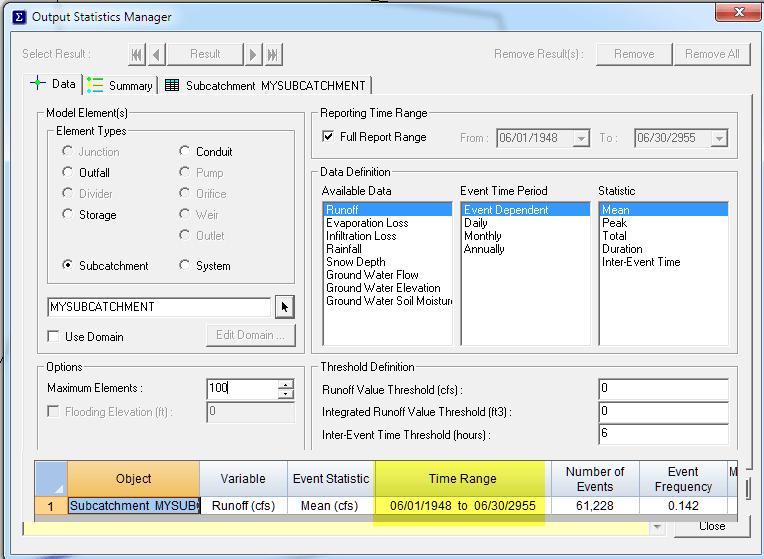 Output Statistics Manger for Analyzing a 1000+ year simulation using InfoSWMM, InfoSWMM 2D, InfoSWMM SFEM and InfoSWMM Sustain.